Sometimes, I’m amazed by the creativity in the world. I mean, who would have thought to cut them up in order to make these fun pool noodle crafts?! And, of course, we are no stranger to DIY kid’s crafts here on Ruffles and Rain Boots. 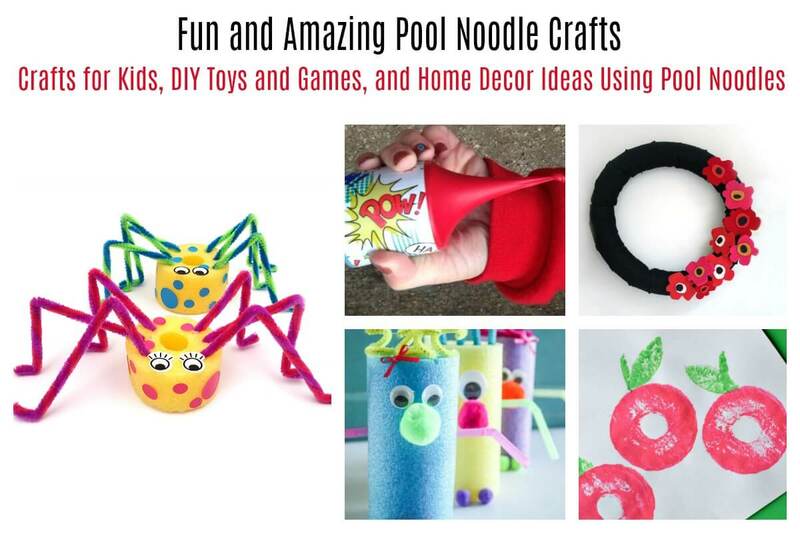 Well, there are definitely some crafty minds out there and we’ve rounded up the most awesome pool noodle crafts, decor, and toys. 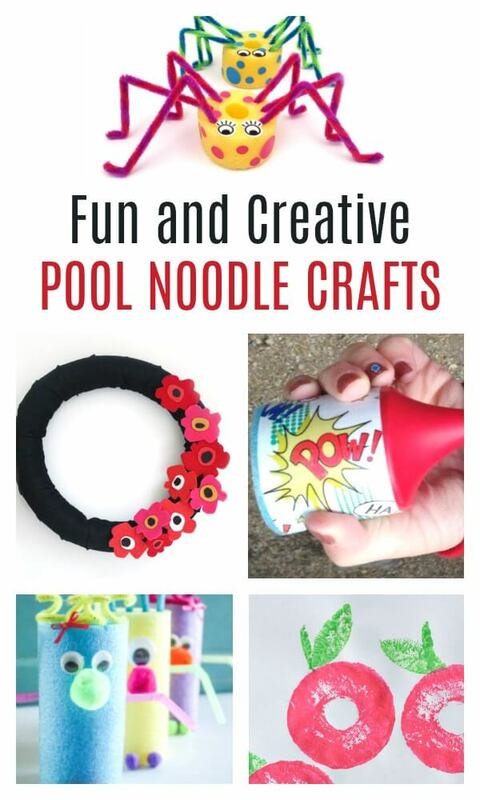 Pool Noodle Monsters by Create Craft Love – This is one of my absolute favorite pool noodle crafts. It allows for so much creativity! Pool Noodle Stamps by Glue Sticks and Gumdrops – We went to a playdate and did this and had so much fun. 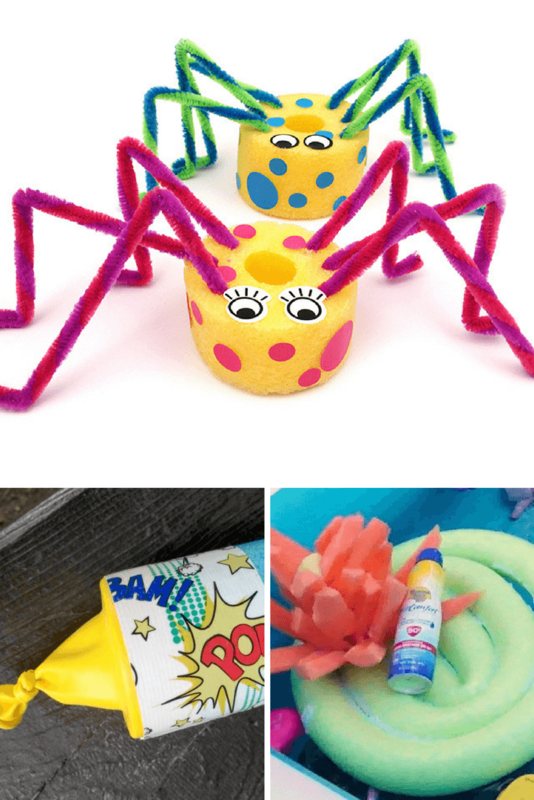 Pool Noodle Spiders by Molly Moo Crafts – Okay, if I’m being honest, I might set this up just so I can make this adorable spider pool noodle craft. Pool Noodle Poppers by The Joys of Boys – Talk about a great way to use pool noodles! We’ve done this with cups but this seems quite a bit sturdier. Pool Noodle Lily Pads by Nerdy Mama – Now this would be a PERFECT craft if you’re learning about the life cycle of frogs. Pool Noodle Nunchucks by All for the Boys – I can only imagine the fun I would have the kids would have with these! Pool Noodle Hobby Horse by Molly Moo Crafts – Now this is a hobby horse I could actually make! Pool Noodle Marble Run by Little Bins for Little Hands – This is one of the best pool noodle crafts I’ve ever seen. Absolute genius! Pool Noodle Luminaries by Create Craft Love – What a great use of old pool noodles – I might line the back deck steps with them at our next pool party. 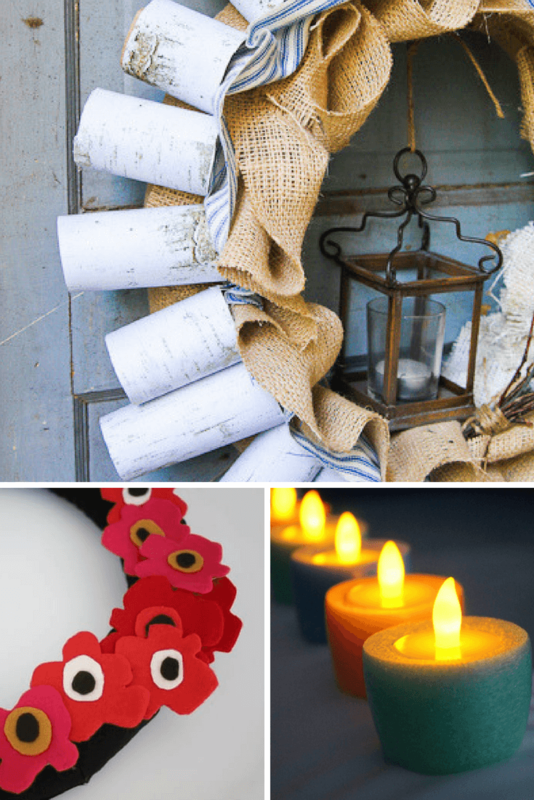 Modern Wreath from a Pool Noodle by DIY Candy – Soooooo, I big, squishy heart love Marimekko, and this wreath calls to me. Faux Birch and Burlap Pool Noodle Wreath by Unskinny Bop – You HAVE to read what she thinks of her wreath. I snorted I was laughing so hard. Pool Noodle Bed Rails by The Kim Six Fix – Crafty mom, happy (and safe) kids. This is a pool noodle craft that gets cheers from everyone. Pool Noodle Floating Chair by The Country Chic Cottage – Not sure it would work for adults, but this is a really great idea for the kids. Which of these adorable, fun, and CUTE pool noodle crafts will you make first? I can’t wait to cut up one of our noodles for those spiders – I thinking they would be great for a kid-friendly Halloween decoration!